1.To enable the wireless charging correctly, phone case (Especially over 5mm one) is highly recommended to be peeled off before charging. 2.Please use QC2.0/QC3.0 adapter for 7.5/10w fast charging mode. 3.Please align your phone with the center of the charging pad for high-speed charging. 4.Please make sure phone's back (or case) is not attached with coins, IC cards, bank cards, magnetic absorbers and any other metal objects in the charging detective area. 5.Built-in battery can only power LED light, you can take it move around in your house or take it with you when travelling. If you are not satisfied with your purchase, please feel free to contact us by service@konsany.cn, or chat on the 'Kang Sheng' facebook homepage. Advanced Safety Tech: Exclusive multi-protect technology provides temperature control, surge protection, short-circuit prevention and foreign object detection. LED indicator light let you know about the status of your charging. Universal Compatibility Wireless Charger: 10W wireless charging for Samsung Galaxy S9, S8, S8 Plus, Note8, Note 5, Galaxy S6 Edge Plus, Galaxy S7, and Galaxy S7 Edge, 7.5W wireless charging for iPhone X / 8 Plus / 8, up to 30% faster than other wireless chargers, iPhoneX can be charged fully in 3.5 hours. 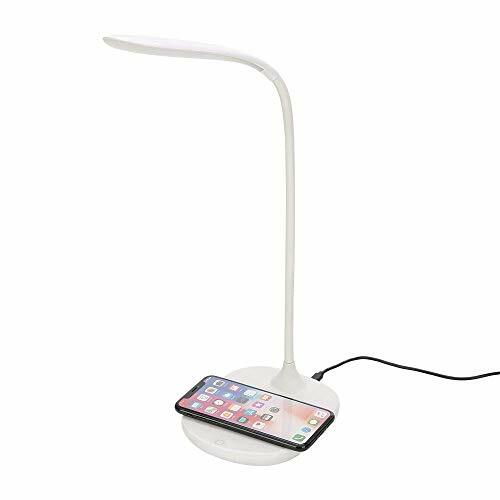 LED Eye table lamp: Built-in 1000mAh lithium battery, LED lamp can continue working about 8 hours on the max brightness. LED light hasn't radiation and flicker, is excellent eye partner. Humanized design: Lamp can be adjusted 360 degrees by free twisted tube, 3-Level adjustable brightness, touch sensor switch, low consumption and long lifespan, the battery can be cycle charged. Multipurpose design: When we charge our mobile phone by the wireless charger, the built-in lithium battery can be charged at the same time, and we also can charge another phone by it's USB port. If you have any questions about this product by KONSANY, contact us by completing and submitting the form below. If you are looking for a specif part number, please include it with your message.